If you take a look in your first aid box or medicine cabinet, it’s likely to contain at least one type of over-the-counter (OTC) painkillers. After all, they’re the fastest route to pain relief, right? But are they the best solution? The most commonly used OTC painkillers are nonsteroidal anti-inflammatory drugs (NSAIDs), such as ibuprofen and naproxen, along with acetaminophen, an analgesic used to relieve pain or bring down a fever. According to 2015 data cited by the Consumer Healthcare Products Association, there are a total of 2.9 billion retail trips annually to purchase OTC products. Also, U.S. households spend an average of about $338 per year on OTC products. These statistics clearly indicate the popularity of OTC medicines, which don’t require a trip to the doctor’s office to get a prescription. Like many, you may not think twice about taking them when you have a headache or back pain. As these medicines provide quick relief and are used by so many people, you may think these drugs are completely safe. But in reality, these painkillers come with many dangers and side effects. The risk of these side effects is higher in people who take these drugs daily and for an extended period of time, and also for those who take prescription medications, especially painkillers. Women who are pregnant or trying to conceive should not take any medicine, including OTC pain relievers, without consulting a doctor first. Here are some of the dangers of taking over-the-counter painkillers. Many studies have linked overuse of NSAIDs to kidney problems. 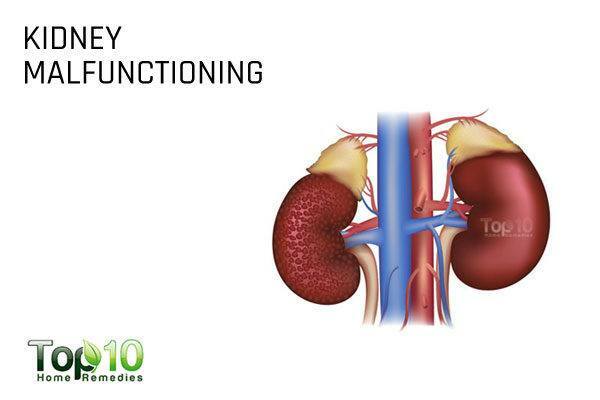 With ongoing use of ibuprofen or naproxen, some people may even suffer from kidney failure. However, this occurs more commonly in people who have other coexisting risk factors, such as diabetes or high blood pressure. A 2015 study published in PLOS ONE reports that the risk of chronic kidney disease varies across individual NSAIDs. Increased risk has been found for ketorolac, which may precipitate subclinical chronic kidney disease through acute renal damage, and long-term exposure to oxicams, especially meloxicam and piroxicam. Another 2015 study published in Hypertension provides supportive evidence that NSAID use is associated with increased risk of chronic kidney disease in people with hypertension. The study emphasized the importance of closely monitoring the effects of NSAID use, particularly in patients with hypertension. NSAIDs can reduce the effectiveness of certain antidepressants, known as selective serotonin reuptake inhibitors (SSRIs). 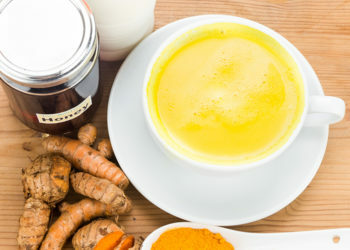 In a 2011 study published in the Proceedings of the National Academy of Sciences, scientists found that NSAIDs significantly reduce the effectiveness of SSRIs. 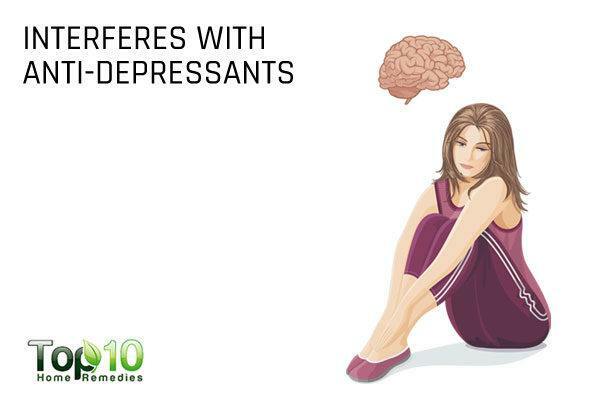 This means that if you are taking NSAIDs and SSRI antidepressants together, there’s a 10 percent greater chance you will continue to suffer from depression, even after taking prescribed medication to treat it. Furthermore, taking NSAIDs while also taking antidepressants can be dangerous. A 2015 study published in the BMJ found that combined use of antidepressants and NSAIDs was associated with an increased risk of intracranial hemorrhage within 30 days of initial combination. Intracranial hemorrhage refers to bleeding under the skull that can lead to permanent brain damage or death. Ibuprofen, naproxen and aspirin all have a mild blood-thinning effect. This will not cause a problem for most people, but it can be an issue for people already taking blood-thinning medication. Unintentional over-thinning of the blood can lead to an excessive risk of bleeding. A 2014 report published in JAMA Internal Medicine found that combined anticoagulant and aspirin therapy increased bleeding risk in patients with acute venous thromboembolism. The combination of NSAIDs and anticoagulant drugs can increase the risk of bleeding, which is often minor but can be fatal in some cases. If you are taking a blood thinner, do not take NSAIDs. Instead, take generic Tylenol (acetaminophen) to get relief from a headache or aching muscles or joints. 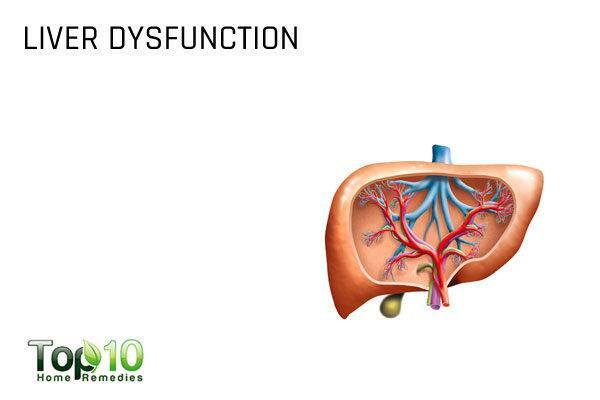 Liver damage is a common risk you take when popping OTC painkillers without consulting a doctor. Of the various OTC medicines, it is primarily aspirin and acetaminophen that can cause harm to your liver. It is due to intrinsic toxicity and often linked to high doses. In most cases, NSAID-related liver injury has evidence of an immunologic cause. Some cases are also related to toxic metabolites of some NSAIDs. A 2010 study published in the Mayo Clinical Proceedings reports that in patients with cirrhosis, NSAIDs should be avoided to avert renal failure, and opiates should be avoided or used sparingly with low and infrequent dosing to prevent encephalopathy. Although ibuprofen and naproxen do not generally affect the functioning of the liver, these NSAIDs are not good for your stomach. Even aspirin is bad for your stomach health. 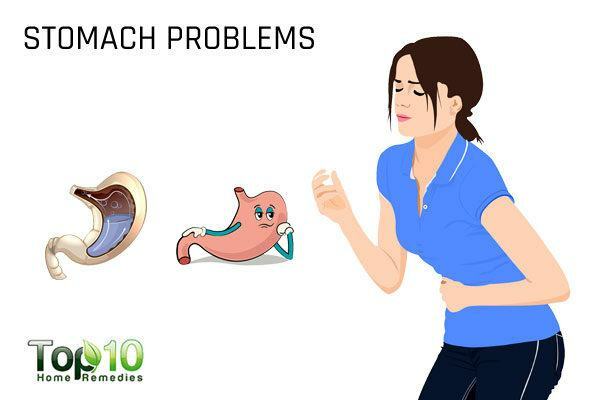 The chemicals in the body that amplify pain also play a key role in protecting the lining of the stomach and intestines. When a painkiller blocks these chemicals, the digestive tract becomes more vulnerable to damage from gastric acids. 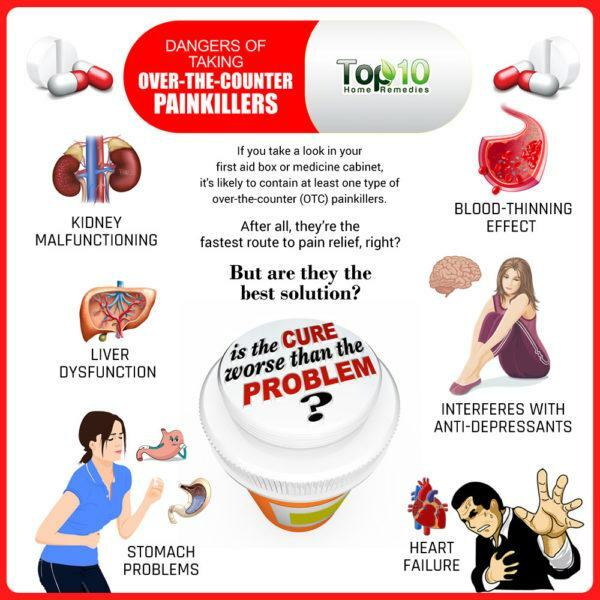 In fact, overuse of these painkillers can harm or irritate the stomach lining. 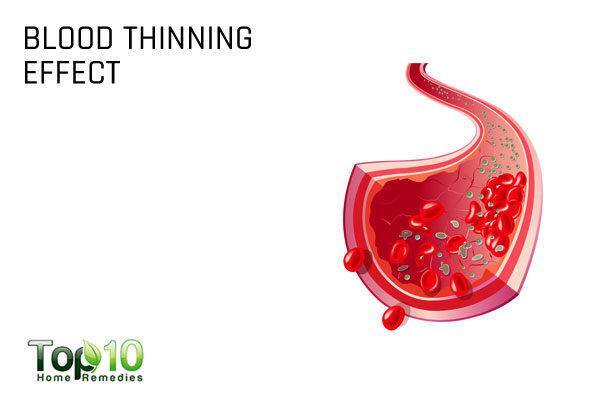 This in turn can cause loss of blood from the irritated area, stomach aches and ulcers in some cases. Given these side effects, those who suffer from a stomach ulcer need to be very cautious about taking OTC painkillers. 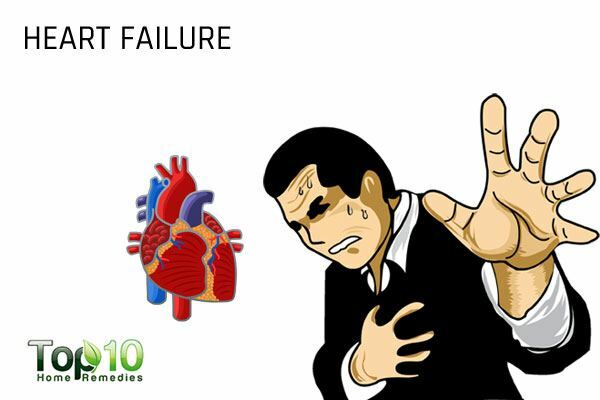 NSAIDs are also associated with an increased risk of heart failure. A 2016 study published in the BMJ offers evidence that the most frequently used, individual traditional NSAIDs and selective COX 2 inhibitors are associated with an increased risk of hospital admission for heart failure. Also, a 2017 study published in the European Heart Journal–Cardiovascular Pharmacotherapy reports that the consumption of any kind of NSAID, such as ibuprofen, could increase the risk of a heart attack by 31 percent. Looking at the side effects of common painkillers, you need to stop popping a painkiller whenever you have a headache or stomach pain. There are many effective and safe alternatives for pain relief that do not come with any of the above-mentioned side effects. An ice pack can effectively reduce swelling and ease pain due to various conditions, from a bump on the head to a sprained ankle. A hot compress can ease pain due to arthritis and other muscle and joint problems. Regular physical activity is also effective at preventing as well as reducing common aches and pains. Many people practice yoga or meditation to enjoy a pain-free life. Non traditional techniques like acupuncture or acupressure are also beneficial to a great extent. Even your diet can make a difference. Include pain-fighting foods and spices in your diet, such as cinnamon, turmeric, garlic, ginger, onion, pineapple and tart cherries.